A weekly post on Wednesdays where I weigh in on the hits and misses in comics, music, television, and pop culture. Favorite Meal: Another boring week–I had leftovers for the first half of the week, and take out Qdoba last night. Going to make something fun this weekend though, since I have it off–just haven’t decided what that might be as yet. Song of the Week: Shooting Star, by Owl City. Total cheese pop, but totally hits me where I live this week. Actually, this whole album is amazingly upbeat compared to some of his earlier work–and while his voice doesn’t always hit that sweet spot we want in our bubble gum pop, the earnestness that made a lot of America fall in love with him after “Fireflies” is still there in spades. Best Media of the Week: Lots of musical media this week. Most recently, we have the grinning Golden in Hip Dog Digs It. I giggled for a half hour watching it. New to some of you, though, may be this next one (especially if you don’t follow me on tumblr) Behold the dancing Robin GIF: Don’t Judge. There’s My Name is Kay’s new video for Strangers, too. Lots of good stuff this week, but hands down my favorite? The Irish President ripping a Tea Party supporter for…well, just about everything he stood for. Take a listen here. Comic of the Week: This was a week of a lot of endings in comic land. Most story arcs in DC’s oeuvre ended this month, due to their flashback month in September. Green Lantern: New Guardians finished it’s first year story arc this week with issue 12, and there were pay offs galore. I enjoy this book, but something felt almost forced about this issue…as if it needed another issue or two to tell all that happened, but because of 0 Month in September they weren’t given the space. I do dig, in a big way, what they’re setting Kyle up for heading into the Green Lantern crossover event that is the next story arc after September’s flashback. Surprisingly, The Unwritten also wrapped up its current story arc this month and it was epic and awesome in the way that book and only that book can be. Honestly, there isn’t another comic out there, in my estimation, with Unwritten’s combination of Gross’ art and the manifold layers of depth in Carey’s written word. It’s the book I save close to last so I can savor it, because I know I’ll have to read it a few times before I really feel like I understand everything happening. The ending of this issue had me shouting “YES!” to an empty room. The best endings are just new beginnings. Without question Flash #12 had some of the best art of the week, and the story was the tightest its been in months. In short, THIS is the Flash book we were promised, and I’m thrilled that we’re headed to a place where we’re done with the moping and we’re getting into the frenetic life of what is arguably one of my favorite comic characters (albeit with other people behind the mask) of all time. Manapul and Buccellato managed to make the watercolors–especially on Glider–so effortlessly beautiful without sacrificing the incredible chaotic energy of life on super speed. Old Friends became enemies, old enemies became friends, and suddenly Central City felt so real again. 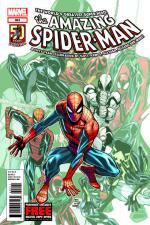 The winner of the week, though, was Amazing Spider-Man #692. It’s an interesting issue. I really don’t like Andy Maguire (aka Alpha), and I get the feeling that was sort of the point. Peter Parker was special in a lot of ways even before that damned arachnid got involved. Andy isn’t. He’s worked so hard to become invisible, to not matter, that when he finally does you don’t necessarily wish him well of it. I think Spidey is amazing about it though, as is the supporting cast. Reed and Ben make great comedic and serious foils, especially dealing with Pete’s history and the common Spidey theme of hubris. I agree with CBR’s review that said Slott easily was channeling Stan Lee when he wrote the issue. It’s a great totally Spidey story, even if I don’t care for his new sidekick. What amazed me the most, however, were the two backup stories. The first was written and penciled by Dean Haspiel. The story was fine enough, though nothing to necessarily write home about–until the last few panels had me in tears. I love Spider-Man for this very reason, for the simple nobility and the purity of what he stands for. Totally reminded me of the issue with Pete and Franklin after Johnny’s death. I love that Haspiel found a tossed away moment in recent continuity and crafted something so totally fitting to honor Spidey’s 50th with it. The man who found the costume was desperate to make “her” happy, so much so that he tried again and again to give her anything she could possibly want–but ultimately all she wanted was his love. Heartbreaking. The second back up was written by Joshua Fialkov, with Nino Plati on art. I don’t typically love Fialkov’s work, but I loved Plati’s manga-inspired art enough to give it a whirl. His muted colors softened what could’ve been a jarring switch in style, and engendered a feeling of nostalgia that ran throughout the tale. Honestly, it could’ve been set almost anytime in Spider-Man’s continuity and it would’ve held up well. As for the story itself, I hope Dan Slott doesn’t take this the wrong way, but that was as solid a Spider-Man story as Slott’s done in his run. I was definitely that kid growing up. I definitely spent the majority of my ‘tweens’ living in my head, to make dealing with the bullying of the other kids easier. I just kept it to myself rather than tell anyone who could hear. But Fialkov made me laugh, made me tear up, and maybe even made me want to fistbump my cat at its awesomeness. There were no humans present, ok? Owein is chill like that. Comic of the Week: Despite me floundering in the end of Kieron Gillen‘s Journey into Mystery (which, the more I think about it, might be one of my favorite comic runs by anyone of all time) all week, whistfully sighing waiting for Marvel to announce that he is writing that teen team-up book with some of my favorite characters ever (WHEN, Marvel, WHEN? ), and the craziness involving travel and business trips for the boyfriend, I haven’t even gotten to last week’s comics yet! But a commitment is a commitment, and I promised you folks an update. So I had the unfortunate burden of heading to Culver’s for comics lunch and reading my entire weekly draw from this week. And there was a lot to read. I should probably give you all a sense of scale. This was a slightly heavy draw week off of my pull list at my friendly local comic shop (flcs, going forward). I had 20 books waiting for me today, spreading between the big 2 (Marvel & DC Comics) and some smaller franchise and independent books. So when I say something was the best of the week, that means it surpassed about 17-19 other titles each week. That means I read approximately 80 comics a month. It also means I’m poor. So, what won out this week? It was a weird pull, because for a change I had a wide spread across a bunch of genres. Valiant’s Harbinger, Mike Norton & Tim Seeley‘s Revival, Brian K. Vaughan’s Saga, and Nate Cosby & Ben McCool’s Pigs #8 were all tight this week, turning in some of the best work yet on all titles. For big payoffs, AvX #10 was pretty sweet (been waiting for a decent moment in this title, as its definitely been dragging). Some books that surprised me were X-Factor #242–big emotional moments, but almost no build up left me wanting to feel more than I did. Red Hood #12 almost made it to the top of the pile, as the storytelling was honestly as tight as I’ve seen Lobdell do since he started his run. It felt very much the epic, star-spanning swashbuckling story they were clearly aiming for with the cover font choice. Avengers Academy 35 (which just announced its end date this fall and I’m trying not to cry) had big emotional payoffs this week and ties for the top spot. I’m going to miss the characters something fierce, despite Christos Gage‘s comment that they may be living on in some way in other title in the MarvelNOW iniative. They won’t be the same without his heart and soul filling them up with awesome. The winner for this week, however, is DC Universe Presents: Kid Flash. What? A one-shot in an anthology series wins best of the week? HECK YEAH, it does! For starters, I didn’t realize how much I missed Fabian Nicieza‘s voice in DC’s teen heroes. I love Scott Lobdell‘s Teen Titans, but Fabian was my go-to guy that made me seriously love Tim Drake–and he does wonder with the New52’s Bart. 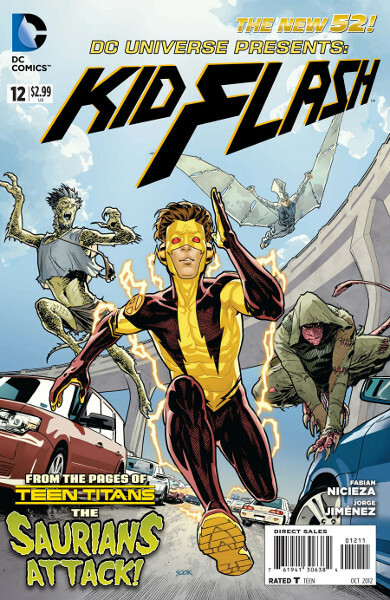 Under Nicieza’s guidance, Kid Flash comes across more serious in this one-shot than in the main Titans book, more experienced and wiser while at the same time keeping his humor and awkwardness that made Bart one of my favorite DC heroes ever. He also goes up against teenage human/dinosaur hybrids that are pretty complex for brand new, one-shot characters. And that’s just the start. I almost want him to lead a team of these dino-kids in a longer running mini-series. The art by Jorge Jimenez is sleek and speedy. I didn’t exhale until I finished the issue, as it was one beautiful ride that slid effortlessly from panel to panel. This makes me crush so hard for this creative team, as well as all of the characters. So if you like dinosaurs, Flash, Bart, or just great teen characters (that ought to be most of you), DC Presents: Kid FLash (#12) is the one comic you should buy this week. Song of the Week: Well, last week it was Primadonna, by Marina & the Diamonds. Early this week, it was Want U Back, by Cher Lloyd. But lately I’ve found myself listening to the remix album of Imagine Dragons’ It’s Time on Spotify on endless repeat. It’s been really energizing, good habit reinforcing, and makes me dance around the house with my gym shorts on. No videos of the latter. Favorite Meal of the Week: This week has been boring for food. Leftovers and frozen dinners. 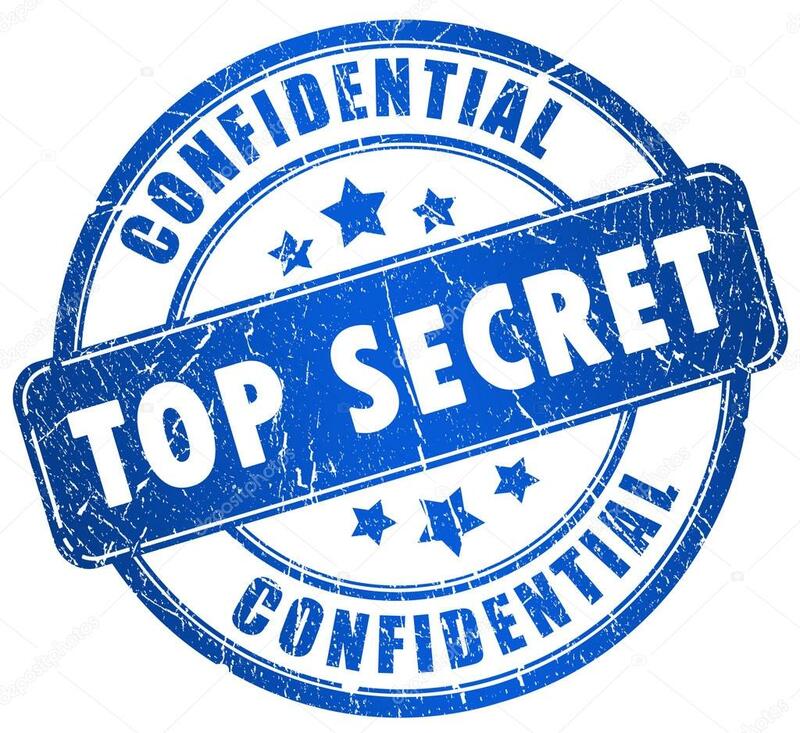 I’ll Have more exciting things to report next week. Best Media Stuff of the Week: Well, the Madonna Bar Mitzvah Boy is big on the gay blogs this week. I feel envious of him, that he’s comfortable enough in himself, and his family and friends that he could let loose like that at so young an age. I definitely used to wish to do things like that at that age. But I think the two best media making the rounds the last week, in the last week or so (keep in mind, some of this is dated but I found it this week) is the story of the momma dog saving her puppies from a burning building in Chile and an old story I found on Kieron Gillen’s tumblr stream about the magic we can give to each other when we rise about ourselves and try to be selfless, even in the smallest ways. That story made me cry, so it wins this week. Read it here.